Pressure-sensor lab went well, Class-D lab revision didn’t work, Blood pressure monitor, Blood pressure lab, and Blood pressure lab part 2 for descriptions of the old labs). The ½” elbow is small enough that I can put my lips around the opening, which would have been a bit difficult with the 1″ tee. To make the apparatus, the students had to drill 2mm holes in PVC elbows, so I packed up my drill press last night and hauled up the hill in my bike trailer this morning. For those unfamiliar with Santa Cruz, that is a 3-mile ride with a fairly steady 4% slope, resulting in a climb of about 715′ (218m). Needless to say, I went slower than usual uphill! There is a drill press only about 150′ from the lab the students were working in, but the bureaucracy for getting the students access to the drill press is incredible (I tried, and failed, to get a dozen students access last quarter). So it was easier for me to haul my own drill press up the hill on my bike than to deal with the dysfunctional bureaucracy at UCSC to use the drill press supposedly there for student use. I explained to each pair of students how to use a drill press, including basic safety precautions, and had them drill a 2mm diameter hole in their PVC elbows. There were no problems with this, and I plan to do the same for the lab in future. 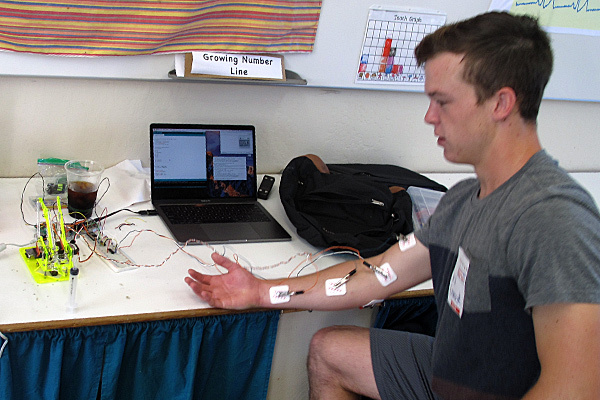 Each pair of students designed an instrumentation amplifier with an INA126P chip as a first stage and an op-amp as a second stage, wired it up on breadboards, checked the calibration, and recorded both breath pressure and blood cuff pressure. A few students used extra time to play around with some toys I brought in: a hand vacuum pump, a Lego pneumatics pump, and an aquarium air pump. One group even tried using the pressure sensor as a microphone, using a loudspeaker with a 300Hz sine wave for input (the pressure sensor could detect the 300Hz input without problems, though I suspect that it was not registering the full pressure fluctuation, as I think that the sensor has about a 200Hz bandwidth). Most groups were done with this week’s lab in the 3 hours of today’s lab, so Thursday’s lab will consist mostly of students doing make-up work to redo old labs, with a few finishing up this week’s lab. I expect to spend most of Thursday’s lab time grading design reports (I’m about 2 days behind—I got the design reports that were turned in a week ago done and returned yesterday, and I got the prelabs turned in yesterday done and returned today, but I haven’t started yet on the reports turned in last Friday, nor the stack of redone work turned in last week). 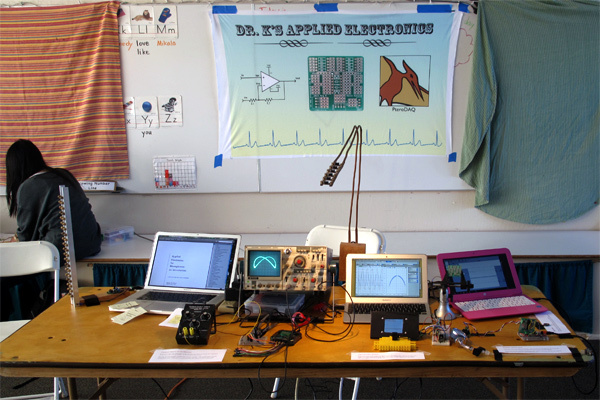 The instrumentation-amp lab went surprisingly well this year, despite adding the drill press. I think that the big advantages over previous years are that they did not have to solder the inst amps this year and that they had already done a multi-stage amplifier for the microphone amp. I think that I should rewrite the book to introduce multi-stage amplifiers as the default design (since every amplifier they do in the course is now multi-stage), and talk about how to choose the gain for each stage in general, before getting into individual labs. One minor problem in lab today—students didn’t have the short pieces of tubing to connect up their breath-pressure apparatus. This turned out to be my fault—I hadn’t included them on the parts list for this year! Luckily the BELS staff had some pieces leftover from last year, and I had about 20 feet of my own tubing in the box of stuff I’d packed for the lab, so we had enough for everyone to get 6″. One leg of the tee holds the 2mm air leak, the stem of the tee holds the barbed fitting for connecting to the pressure sensor, and the other leg of the tee is for putting around my mouth. Perhaps I should try again with just a 1/2″ female threaded tee—that may be cheap enough that every student can have their own, and only the barbed fittings (which get no flow through them) would be shared. Students wouldn’t even need to buy their own—I could have a stock of 50 of them, and wash them in a dishwasher after the lab. I was able to get similar expiratory breath pressure measurements with either apparatus, but I had trouble getting a good seal for inspiratory measurements with the ½” elbow—I kept getting leaks at the corners of my mouth. None of my measurements today (with either apparatus) got up to the pressures I observed yesterday. I’ll practice with it a bit more—maybe adding a short length of ½” PVC that I could put a little further into my mouth. If I can get it to work consistently, it is certainly a cheap enough solution for every student to have their own—79¢ each for the elbows at the hardware store, but only 20¢ from PVC fittings online. I was not able to figure out where I had bought the 3/16″ barbed fittings from, but I found some for 62¢ each (in 10s) from Cole-Parmer. At that price, I might even have the students each buy their own, with only the pressure sensors themselves being reused. 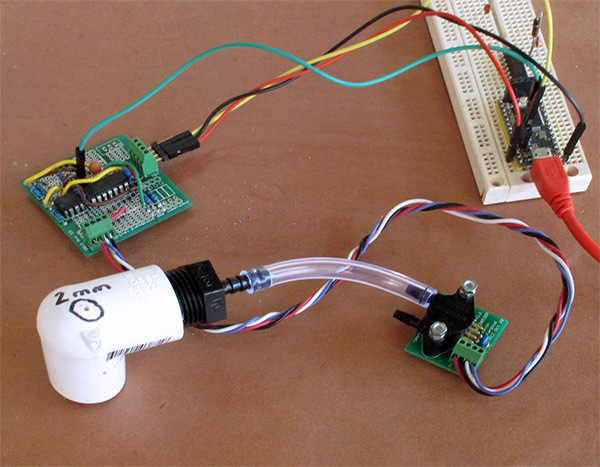 I was never very happy with the breath pressure measurements we made in the applied electronics class, because blowing into a little 3/16″ hose did not correspond well with the measurements reported in the literature. For one thing, the professional measurements are not into a closed tube, but into a small chamber that has a 2mm diameter hole as an air leak. My fix for this last year was to ignore breath pressure and concentrate on blood-pressure cuffs instead, which worked pretty well. 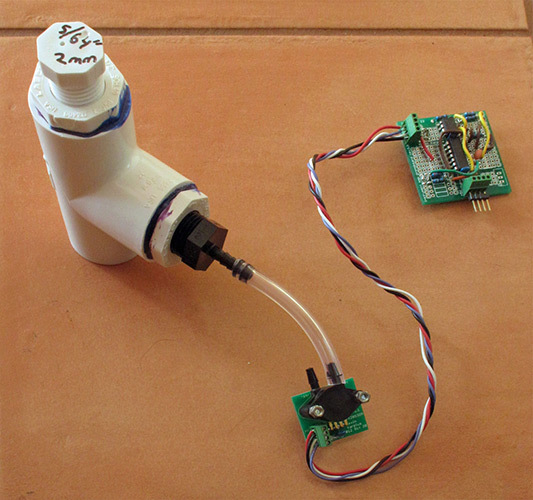 But breath pressure should be easy to measure also, so this week I started looking at making cheap apparatus for doing breath pressure properly. My first attempt just stuck a barbed tee into the hose. Since the opening of the tee is about 2mm, this should give the pressure vs. air flow curve we need. This cheap approach sort of worked, but I was not able to get very high pressures recorded—much less than what the literature suggests should be average for a man of my age. I’m pretty sure my lungs are in better than average condition, both for volume and pressure, so I don’t think this simple setup measured breath pressure well. I don’t know whether the problem is the mouth-to-tubing fit, pressure loss along the tubing, or the tee not really behaving like a 2mm orifice—my understanding of fluid flow in tubes and through orifices is rather weak. The screw-in plugs allow replacing the hole, in case I want to experiment with different size air leaks. The 1″ circle of the tee provides an adequate seal around my mouth, but is not particularly comfortable. The parts cost about $5, so the apparatus is cheap enough. With this device I managed to get breath pressure measurements comparable to what was reported in the literature, though it took some practice to get high pressures—normal breathing emphasizes high volume, not high pressure. 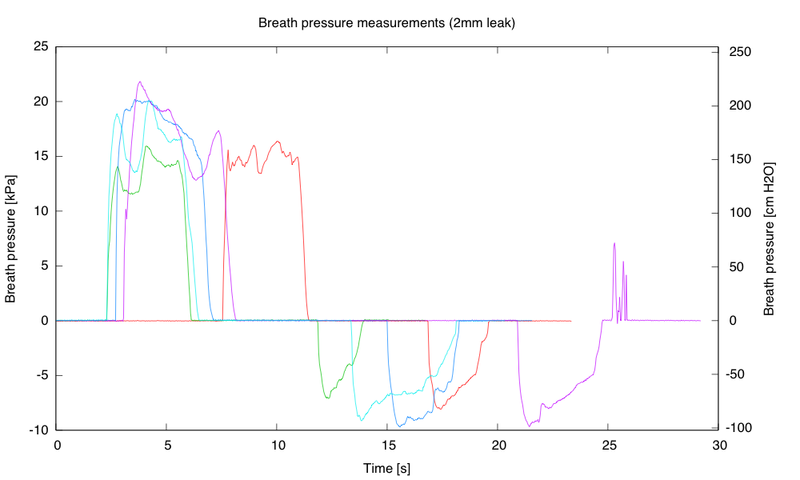 Plot of high-pressure exhalations followed by high-pressure inhalations (five attempts). I moved the apparatus away from my mouth between breaths, so these are not full breath cycles. I don’t know exactly what the noise at the end of the magenta trace is—probably jostling a loose connection. So the breath-pressure apparatus works, but I’ll need to think more about whether to build a dozen of these for the course. There are questions about cleaning the apparatus between users, for example—I don’t want to be spreading cold viruses among my students! Is there a way to make the apparatus more comfortable to use and get a better seal around the mouth. Commercial peak-flow meters use disposable cardboard or plastic mouthpieces that cost about 35¢ each (in 100s from Amazon), and redesigning the apparatus to use them might be worthwhile—but even then the recommendation is to clean the equipment between users, unless one-way (exhalation-only) mouthpieces are used. The standard usage (based on pictures on the web) appears to be to have a mouthpiece small enough to go into the mouth, so that the lips seal around it—my current design does not have that. Perhaps I should try again with just a 1/2″ female threaded tee—that may be cheap enough that every student can have their own, and only the barbed fittings (which get no flow through them) would be shared. Students wouldn’t even need to buy their own—I could have a stock of 50 of them, and wash them in a dishwasher after the lab. I’ll have to see how well that works.